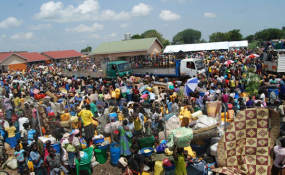 Koboko — More than 23,000 South Sudanese and Congolese refugees have abandoned their settlement camps to settle in Koboko Town, a survey report has revealed. According to the report, a total of 23,128 self-settled refugees in Koboko Municipality form 35.4 per cent of the total population of 65,000 residents in Koboko. The survey carried out by VNG, an international cooperation agency of the association of Netherlands' municipalities operating in West Nile Sub-region, also shows that 88.8 per cent of the self-settled refugees are from South Sudan, 10.3 per cent come from DR Congo, 0.5 per cent from Somalia, 0.3 per cent from Sudan, 0.07 per cent from Eritrea while 0.03 per cent comes from Burundi. The report shows that some of the refugees are pushed out of the settlement camps due to poor social amenities, inadequate provision of food and medical supplies. The survey was based on complaints from authorities that urban refugees are putting pressure on the already stressed service delivery in Koboko Municipal Council. While launching the report on Tuesday, the State Minister for Northern Uganda Rehabilitation, Ms Grace Kwiyucwiny, said: "This report will be discussed by the ministry of Relief and Disaster Preparedness to see how it can be harmonised with the national policy for appropriate implementation of catering for these refugees as well." She added: "It is true that the municipality has meagre resources which are now being shared by both the refugees and locals. But you cannot chase the refugees away; you have to live with them." The Koboko Municipality mayor, Mr Wilson Sanya, described the refugees as their brothers and sisters whom they have to share the resources with. "But sometimes, we are constrained to budget for them because there are few schools, health centres and water sources. Indeed, they pose challenges and we ask government to make considerations for us hosting the urban refugees so that their lives can be improved," Mr Sanya said. Ms Jane Poni, South Sudanese refugee now living in North Division, said: "In the camps, land is not enough and yet what we get is not adequate to care for our needs." She said sometimes the food rations get finished before end of the month, making it difficult to feed their families, which prompts them to go to town and access some land in the communities to grow crops and if possible sell produce to support their families. VNG International social cohesion and legitimacy expert, Mr Sam Ejibua, said the survey project was conducted between July and August this year. He said the survey would be used to lobby for resources for the refugee hosting districts to better the lives of the self-settled refugees. The survey carried out by VNG, an international cooperation agency of the association of Netherlands' municipalities operating in West Nile Sub-region, shows that 88.8 per cent of the self-settled refugees are from South Sudan, 10.3 per cent come from DR Congo, 0.5 per cent from Somalia, 0.3 per cent from Sudan, 0.07 per cent from Eritrea while 0.03 per cent comes from Burundi.